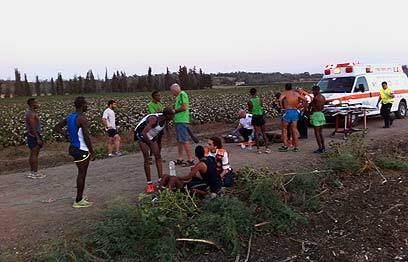 Two teenage joggers were injured on Friday when they were hit by an all-terrain vehicle while training near Kibbutz Givat Brenner, Ynet has learned. "I didn’t make any remark to the driver (of the ATV), but he hit my leg anyway," said 19-year-old Radet Baletta, who was injured in the hit-and-run along with her 15-year-old friend. "He almost ruined our lives. I hope he is caught and punished." Shfela District police are looking into the possibility that the ATV driver had hit the joggers intentionally. 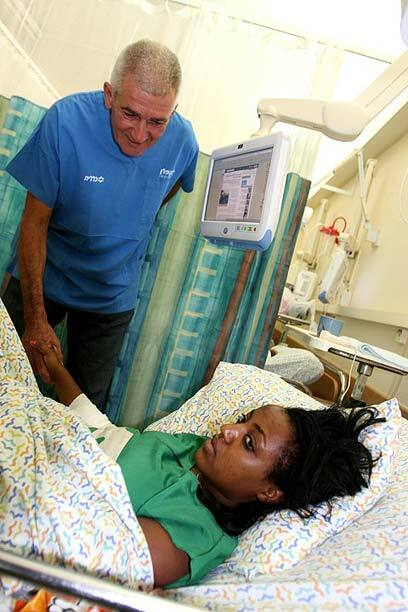 The girls are still hospitalized at the Kaplan Medical Center in Rehovot. Baletta, a Ness Ziona resident, sustained moderate to serious wounds. Her friend, a resident of Rishon Lezion, sustained light to moderate injuries. "About six kilometers from our starting point a man riding on an ATV appeared. He passed by us, but then he turned around and hit us from behind," Balta told net. The two girls belong to a team of 15 joggers who train together. Some of the joggers hope to qualify for the Olympics. Luckily, Dr. Rafi Vishnitzer, a lung surgeon at the Kaplan Medical Center, was accompanying the joggers at the time of the accident. "As we were jogging an ATV approached at a high speed and left us in a cloud of dust. The male joggers signaled him to slow down, but he tried to hurt one of them with his leg. When he failed he turned around and drove towards us, but the coaches moved the joggers to the side of the dirt road. However, because of the clouds of dust and the fact that he approached from behind, two of the female joggers didn’t see him coming and were hit," the doctor said. "He was wearing a helmet, so it will be difficult to identify him," Vishnitzer said. A relative of the injured 15-year-old said she underwent surgery Friday night. "She doesn't remember anything, but her coach said they were flung into the air by the ATV. I hope he turns himself in, but I don’t think he will because he hit them intentionally," the relative said. See all talkbacks "Teenage joggers injured in ATV hit-and-run"